You may well have heard that soy has specific health benefits because it is particularly high in a class of phytochemical known as isoflavones. While isoflavones are present in various legumes, soybeans have by far the most concentrated amounts of these potent compounds. Soy actually contains a number of isoflavones but the ones that appear to be most beneficial are isoflavones called genistein and daidzein. Isoflavones are also a phytoestogen or a plant-based hormone that mimics the effects of human estrogen. Because of their ability to mimic the effects of human estrogen, isoflavones may provide a variety of health benefits and help people avoid disease. On the other hand, their ability to mimic estrogen has caused concern about the effects of soy protein and soy products on men. Many men now shy away from soy because of the potential side effects of isoflavones on men. There is a large body of research into the effects on human health benefits of soy isoflavones. Research indicates that they can improve heart health and prevent heart disease by preventing arterial plaque from accumulating. There is also evidence that isoflavones might reduce the risk of breast cancer and prostate cancer. Among their other potential benefits, isoflavones might help prevent the symptoms of the menopause and protect against osteoporosis. Isoflavones have powerful antioxidant properties that can protect against disease in general but are known to have a beneficial effect on the heart. The antioxidants present in isoflavones protect the heart in various ways. First of all, they protect against oxidation of LDL cholesterol, When LDL cholesterol is oxidized, it accumulates inside the arteries and the fatty buildup or plaque eventually impedes the proper flow of blood and results in a disease called atherosclerosis. Studies indicate that geinstein inhibits can inhibit the growth of the cells that make up this plaque. (1) (2) The damage caused to the arteries by atherosclerosis eventually leads to the formation of blood clots that increase the risk of heart attack or stroke. Isoflavones have demonstrated the potential to protect against certain types of cancer including breast cancer and prostate cancer. A large-scale study conducted by researchers from China and the US set out to determine the effects of consuming soy-based food on the recurrence of breast cancer among survivors. The study involved over 9,500 women from both China and the US who had survived breast cancer. The researchers monitored their consumption of soy isoflavones for over seven years before drawing their conclusions. As well as their protective effect against breast cancer, a number of epidemiological studies indicated that there was an inverse relationship between the intake of soy and the risk of developing prostate cancer. This has led researcher to investigate this link and a number of studies have been conducted. An Italian study published in 2012 was conducted to evaluate the effectiveness of isoflavones on relieving menopausal symptoms. The results were promising but mixed. The women who took soy isoflavones experienced a 40% reduction in certain vasomotor symptoms including hot flashes, depression and insomnia. However, the isoflavones had very little effect on other symptoms experienced during menopause such as vaginal dryness, bone and muscle pain. A recently published meta-analysis concluded that soy isoflavones could help to significantly reduce the body weight of menopausal women. READ What is Carrageenan and Should You Avoid It? Isoflavones may also play a key role in bone health protecting them from damage maintaining their strength. There is evidence that genistein as well as daidzein can help improve bone integrity and protect them from weakness. When it comes to the effect of isoflavones on brain health and cognitive function, results have been decidedly mixed. A number of studies have taken place to evaluate the effects of soy isoflavones on cognitive function and many involved menopausal women. The results have varied widely. 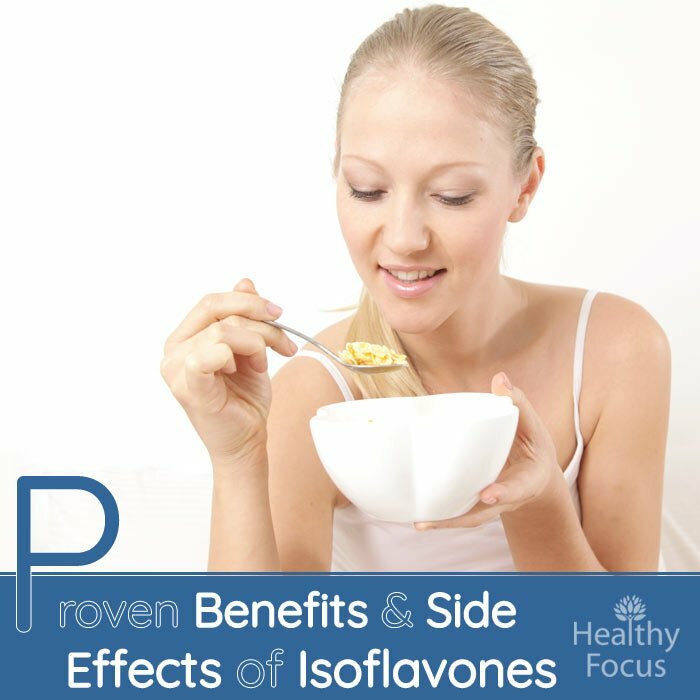 The best way to increase your intake of isoflavones is in the form of food. – specifically soy based products. This ensures that you get all the additional nutrients and protein from eating soy. There are plenty of soy products that you can add to your diet including tempeh, whole soybeans, textured vegetable protein, tofu and soy milk. While soy is generally regarded as a safe and healthy food for most people, there are certain health risks many of which are associated with its estrogen-like effects. Breast cancer : The studies are far from conclusive but some suggest that soy isoflavones may increase the risk of developing breast cancer. Women suffering from breast cancer are recommended only to eat small doses of soy. It is also possible that soy can interact with certain cancer treatments like tamoxifin so please check with your doctor to ensure that eating soy is safe for you. Thyroid Disorders : There may be a link between the consumption of soy and an increased risk of thyroid disease. Soy isoflavones may cause hypothyroidism and goiters because of the way they interfered with thyroid synthesis. Digestive Problems : Soy isoflavones are known to trigger a food allergy in sensitive people. Side effects of this allergy include stomach irritations, and digestive disorders as well as itching and runny nose. Soy supplementation has been linked to varosteoporosisious digestive complaints including bloating, cramp, constipation and diarrhea. Headaches : Soy isoflavones are also known to cause migraine headaches in certain people. People who have an allergic reaction may also develop headaches because isoflavones can both increase heart palpitations and heart rate.